When will they ever learn that only Sustainability and real intelligent supply & trade will be good for the economy and not greed? Oh dear Heaven! TPP and TTIP are terrible things that destroy democracy and give power only to corporations in secret courts - you'd think that was bad enough! Sabine G is right. 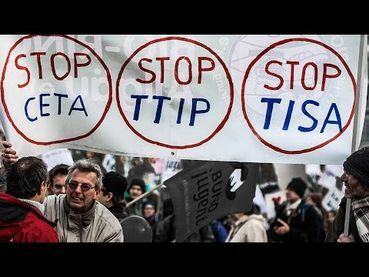 Start thinking outside your own box for once America: the effects of TISA and TPP and TTIP are bad for ALL of us, global economy AND global control will be in the hands of the large companies and oversight is out of the window EVERYWHERE. I value the rather strict oversight by my own government, although it has become rather more slack over the years, but I hate to be at the mercy of American companies like Monsanto or of Swiss banks or... Remember: "Do not do unto others what you do not want others to do unto you". We owe a great deal of gratitude to Wikileaks but until the mainstream media really jumps on this few people will know of it. Then in the USA we have a President that is pushing for all of these despicable trade deals. One horror show upon another. Protection to Corporations for something they "may" do in the future. This seems like a pee shooter to attack a giant but at least we add our names to others. Weird, your comment wasn't in this new article when I last looked, Dandelion. Or, perhaps it's the Trans Atlantic delay!